Theater: Can a Cooled-Down ‘Network’ Work on Broadway? Theater Review: Can a Cooled-Down Network Bring the Heat? Ivo van Hove and his designer Jan Versweyveld have created a signature style out of putting hot-blooded plays inside cold, technological boxes. They build worlds with hard, looming walls, often stripped of color and bristling with screens, with nimble, black-clad live-feed camera folk following the actors around like cat burglars. The director’s productions that have affected me most deeply are those in which his slick, almost sterile landscapes, with all their menacing digital propulsion, have been filled out with real human fury and passion — with stories and performances that seem to rage against their environments, bringing a fraught, flickering heat to the bowels of the machine. When I go sour on the van Hove-verse, it’s in part because what’s inside the box has remained as cold as the box itself: Something in the people is detached where it should be connected, and the director seems more enamored of his images than his actors. Network — Lee Hall’s adaptation of the many-Oscared 1976 Paddy Chayefsky–Sidney Lumet film — seems like prime territory for van Hove: A dark satire about the maniacal cynicism of mass media, with a call for (and commentary on) cameras and screens, as well as a combustible center in the character of Howard Beale, the disillusioned, increasingly deranged anchorman who’s manipulated into becoming a railing on-air prophet of national discontent. But there’s something flat about van Hove’s production. It’s got all the requisite external flash, and Lee Hall’s adapted script is clear enough in its outlining of the story’s heightening stakes — the problem is, we recognize those stakes intellectually, but we don’t really feel them. Whereas Lumet worked painstakingly — and theatrically! — to get blazing performances out of his entire ensemble, van Hove has only one actor who’s truly on fire. Bryan Cranston’s Howard Beale is a ferocious performance, hurtling from dry and almost twinkle-eyed to racked with pathos, rage, and disgust. He’s a diabolical pleasure to watch, and yet, despite his centrality, he’s not the play. Van Hove’s Network treats the parable of Beale’s rise and fall as a star rather than a fully fleshed-out ensemble drama. When Cranston isn’t there, the temperature drops noticeably, and as Beale becomes more and more untethered from sanity, the comparative monotony of van Hove’s work with the rest of the play’s cast starts to become glaring. Yet Howard Beale isn’t even really the story’s protagonist. If that honor belongs to the character who most consciously drives the action, then in Network it’s Diana Christensen. She’s the primary puppet master behind the Howard Beale phenomenon, which begins when the anchor announces on air that he plans to commit suicide during his final broadcast, and soon spirals into a rabid, nationwide spectacular — “news” as apocalyptic performance art. “I’m mad as hell, and I’m not going to take it anymore!” goes the iconic line, eventually chanted by Beale’s hordes of fans, who gleefully turn the words that poured out of him during a genuine on-camera breakdown into an unthinking populist battle cry. (Was it inevitable that we in the audience would be asked to shout these words? Perhaps, but I cringed at the number of times our participation — which, if we’re listening to the story at all, we should know is being mocked for its mindlessness — was grinningly called upon. If I’m allergic to any four words from an actor, they might be, “I can’t heeeear youuuu!”) When Beale, soaking wet and clad in pajamas, staggers into the studio and shoves aside his replacement, the blandly clean-cut Jack Snowden (Barzin Akhavan), Diana keeps the cameras rolling. Her gamble pays off: people love this crazy-eyed evangelist. Beale, who’s actually unraveling, will rake in the profits for the network by coming apart on live TV. But as in Lear, the crumbling giant in Network needs to be surrounded by equally precise and powerful performances, or the play diffuses along with its mad king’s wits. 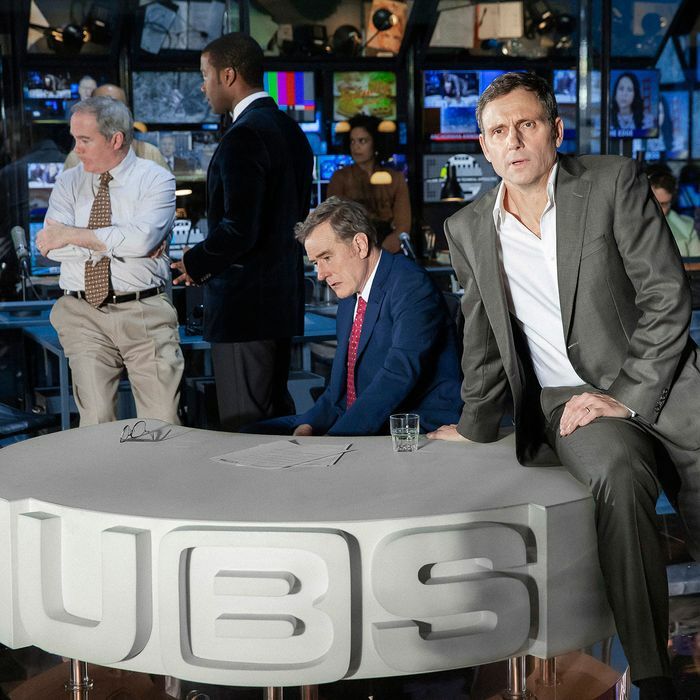 Van Hove and Versweyveld have placed the entire play in the newsroom, which means that we’re looking at a single set in which we often have to suspend our disbelief. The bulk of Howard’s story unfolds in its natural habitat, but the other plotlines — which take place in back rooms and corner offices and bars and people’s homes — have to make nonliteral use of the techno-box. Such a setting tasks actors not only with connecting with each other, but with transforming the space in our minds through the power of their performances. Technological stunts, like a real-time onscreen feed of two actors on the street outside the theater, can create novelty but not dramatic heft: More than the cameras, the people have got to move us. And other than Cranston, the people in Network feel stuck, sometimes overwrought and often stiff. They’re gamely going through the motions of a high-tension drama, but van Hove hasn’t always helped them viscerally connect with the text or each other. (Julian Elijah Martinez, as the associate producer Harry Hunter, is an exception — he’s comfortable in his skin, but his part isn’t large enough to turn the tide.) As Diana, who has a ratings monitor instead of a heart, the Orphan Black Emmy winner Tatiana Maslany is determined but declawed. She should be charismatic and terrifying — a wolf in power boots and a pixie cut; instead, her attempts at pitiless, unflappable cool come across as a little wooden. She’s so good, and so excitingly mutable on TV, that it’s a shame to see her stranded onstage. She’s trying hard, but her Diana isn’t frightening, and there’s no real chemistry between her and Tony Goldwyn as Howard’s friend and erstwhile newsroom boss, and the play’s corrupted moral center, Max Schumacher. As Max and Howard, William Holden and Peter Finch were both nominated for Best Actor Oscars in Lumet’s film (Finch won posthumously, having died of a heart attack only months after the movie was released). But in van Hove’s production, Goldwyn’s performance comes nowhere near to registering on the same level as Cranston’s. It’s not simply a matter of acting: The character isn’t being treated, by playwright or director, with weight and pathos equal to that of Beale’s manipulated madman. The Max-and-Diana B-plot turns out to be where Network’s heart lies. 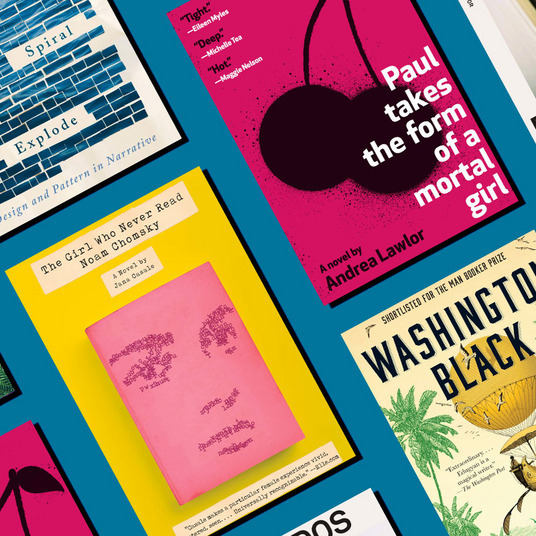 As the mad-as-hell A-plot spirals off into dystopic, darkly prescient satire, the story of Max’s temptation, revelation, and uncertain redemption is our link back to our own humanity. What’s ironic is that van Hove and Hall add a coda to their production in which Howard, stepping outside his own story after its violent climax, encourages exactly this kind of forgiving, open-eyed, interpersonal faith in us. “The only total commitment any of us can have is to other people,” says Cranston, and as with his entire performance, the moment lands. But it feels unprecedented, a moral that hasn’t been sewn into the fabric of the story throughout. We might have sensed its thematic significance earlier had Max’s arc felt more compelling, had the show’s whole human network shared the electricity and depth of feeling of its central performance. Network is at the Belasco Theatre. Bryan Cranston grabs hold of mad-as-hell Howard Beale.